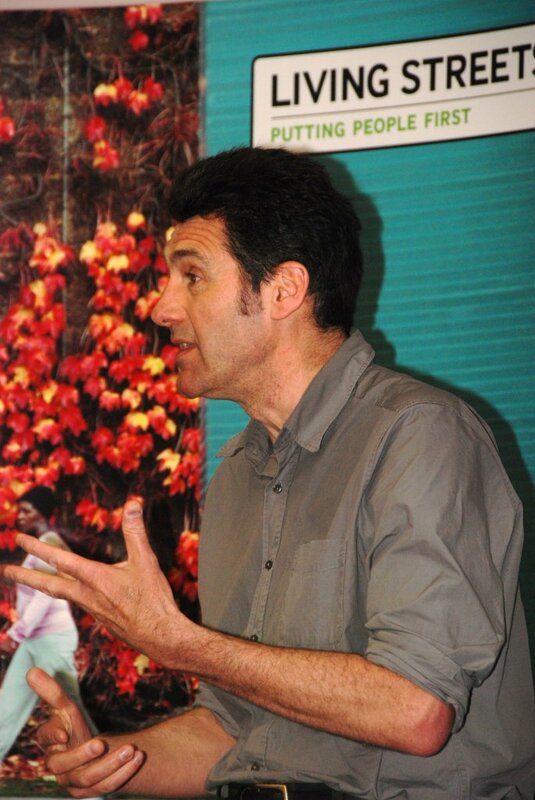 A presentation was given by Jeremy Leach of Southwark Living Streets, about what their group did and how they do it. Tips included starting summer meetings with a walkabout in an area of interest, invite local councillors to present on issues that they are working on, and to work at borough level (e.g. 20 mph speed limits), area level (e.g. particular project Windsor Castle), and local level (e.g. planting, greening, and splayed junctions). Getting to know how the council works, by starting with local councillors and working across political parties. It helps if a member of the group is also a member of the local party. Now is a good time to present ideas with an election due next year. Jeremy (along with Josh Hart and Alastair Hanton) answered questions. Alastair gave the tip that when people attend meetings they should be given something to do, however small, in order to ensure they return could be to represent a geographical area just to give them a sense of doing something useful. A delegate asked for more information on funding bids. Jeremy said that funding (for London boroughs) was through Local Implementation Plans, and Alastair added that a great way to get funding was to get those responsible for making the bid to walk around with the group.